Female cabin crew at Cathay Pacific have won a battle to scrap a rule forcing them to wear skirts. Some crew had complained that wearing short skirts had made them feel uncomfortable - especially when putting bags in overhead lockers or taking public transport to and from work. 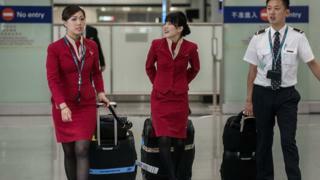 "We welcome and appreciate the company's decision on giving us an option in choosing uniforms," said Pauline Mak, vice chair of the Hong Kong Dragon Airlines Flight Attendants Association. The skirts-only rule has been in place since the airline was founded in 1946 - despite a growing backlash which appears to have gained even more momentum during the #MeToo movement. Flight attendants had requested a redesign of their workwear in 2014 - saying the skirts were too revealing and may provoke sexual harassment. Ms Mak said the policy change "not only provides us one more option, but also provides us with protection". The airline said uniforms would be re-evaluated for crew working for both its Cathay Pacific and Cathay Dragon carriers. "Just as we recognise it is important to provide our customers with more choice, the same is also true for our colleagues," an airline spokesperson said.